Three Rivers Press, 9781984824448, 240pp. Beautifully designed and gorgeously illustrated, this immersive, puzzle-like exploration of the history and psychology of mazes and labyrinths evokes the spirit of Choose Your Own Adventure, the textual inventiveness of Tom Stoppard, and the philosophical spirit of Jorge Luis Borges. Labyrinths are as old as humanity, the proving grounds of heroes, the paths of pilgrims, symbols of spiritual rebirth and pleasure gardens for pure entertainment. 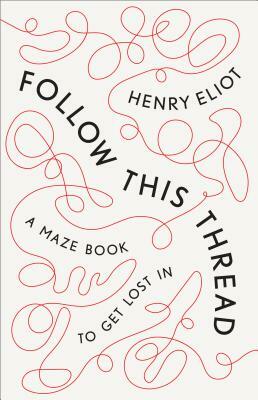 Henry Eliot leads us on a twisting journey through the world of mazes, real and imagined, unraveling our ancient, abiding relationship with them and exploring why they continue to fascinate us, from Kafka to Kubrick to the myth of the Minotaur and a quest to solve the disappearance of the legendary Maze King. Henry Eliot is the creative editor of Penguin Classics. Having studied English Literature at Cambridge University, he has spent the past decade immersed in literature, creating a mass public pilgrimage for the National Trust inspired by William Morris, recreating Chaucer's Canterbury Tales to raise money for the National Literacy Trust and leading a number of literary tours, including a Lake Poets tour of Cumbria and a quest for the Holy Grail based on Malory's Morte Darthur. He was a Trustee of the William Blake literary society for three years. He is the author of Follow This Thread, a maze-like book about the history and psychology of mazes, and Curiocity, written with Matt Lloyd-Rose, an illustrated book of unexpected London journeys and experiences. "Beautifully disorienting...A fun book to get lost in." "Delightful, ingenious, and beautifully designed." "Captivating and informative.... Getting lost and found in Eliot's contemplative prose and Quibe's clever drawings is a...gratifying experience." "An utterly unique reading experience." "Real labyrinthine fun ... a remarkable feat of creativity."